UPDATE 1-24-2019: Perrigo has resumed production of their 20 mg/ml and 40mg/ml estradiol valerate generics, and they are now widely available. However, in Southeast Asia a new fake “Progynon Depot” product is being sold to unsuspecting customers online. See below for description of the fakes, and see the chart for the current status of availability for injectable forms of estradiol. [Older] UPDATE 9-9-2018: Perrigo states that there is a limited supply of the 40mg/ml generic available. Perrigo also forecasts that the 20mg/ml generic will become available this month, in September. [Older] UPDATE 6-26: (1) Perrigo has declared, finally, an official shortage, but confirmed that they intend to CONTINUE production of EV in 20mg/ml and 40mg/ml strengths. Their announcement says “Perrigo has estradiol valerate 20 mg and 40 mg vials on back order and the company estimates a release date of August 2018.” (2) A new shortage of Estradiol Cypionate injection in the Los Angeles area has been reported by patients. (3) One patient in Sweden has reported a shortage of Polyestradiol Phosphate (Estradurin). Once again, in 2018 shortages of injectable estradiol appeared. AMAB trans women who are entirely dependent on injected estradiol were finding that their usual prescription was entirely unavailable. And a sense of panic was setting in. Survey: “How much stock of estradiol injectable have you accumulated?” in the HRT Hormone Group, showing how extensive personal stockpiling is underway by injectable Estradiol and Progesterone users. This is not new. In 2016, a massive shortage developed which did not resolve itself until nearly the end of the year. That time, it was Par Pharmaceuticals, who manufactures Estradiol Valerate (“EV”) under license, who could not produce new stock of the brand-name Delestrogen injectable, due to shortage of approved oil for the medium. In 2018, we were in a similar situation. Talking to trans women, I often encounter suspicion that someone (“they”) are conspiring to take discriminatory action against trans people, or alternately to corner the market and raise the prices. However I think it’s wrong to get upset at the manufacturers in this case. Their projections every year are being blown away by new demand, due to the explosion of new trans women taking injections — and every time there is a shortage, there is a new surge in hoarding and over-ordering too. Bad production decisions, exponentially growing demand, personal stockpiling or hoarding, and unexpected shortages of raw materials, are the factors which appear to be to blame, not a conspiracy to deprive trans people of essential hormones. First, let me remind you that there are COMPOUNDING PHARMACIES who can make custom injectables, including estradiol valerate injectable. This article is not about them, but for many, they are a good source. This article is about commercially manufactured sources. I will follow up with an article on compounding pharmacies later. For most estradiol injection users who were buying Perrigo generic estradiol, the easiest alternative to locate is the brand name drug Delestrogen, which costs about 5-8 times as much as the generic. The 40mg/ml strength is not plentiful, but there seems to be a good supply of the 20mg/ml strength. Warning: counterfeit (fake) drugs. Those who are seeking alternate sources of the widely used Progynon-Depot, which was discontinued by Cadila Health in India in late 2016, have found individuals selling Progynon-Depot online, but it’s known that the currently available product is a counterfeit and in some cases has questionable potency and quality. Buying the “Cadila” brand of Progynon-Depot should be avoided. However, the license to produce Progynon-Depot in Japan, formerly held by Nihon Schering, was passed on to Fuji Pharmaceuticals in 2015 or 2016, and production is underway currently there. A few individuals have offered the Fuji Progynon-Depot for sale privately, and it seems less likely to be counterfeit. However it remains suspicious that the Fuji brand is not yet being offered by one of the two major online distributors as a replacement for the Cadila brand. The possibility that it is a target of counterfeiters cannot be entirely ruled out yet, or in the future. In January 2019 a new fake “Progynon Depot” appeared, labeled Estraval and marked as being made by Actiza. This product appeared on dozens of small health and hormone online sales sites, finally being sold by InHousePharmacy.Vu — but an immediate wave of buyer complaints caused the product to be withdrawn. Our group had several who used the product and their lab tests showed little or no estradiol. Note that one way to make an injectable estrogen is to make it with a dangerous and cheap synthetic, Ethinyl Estradiol, which can produce some estrogenic effects but does not register as estradiol in lab tests — such a fraud would endanger the users — but so far, the product seems in many cases to simply have no active ingredients at all. In Europe, an estradiol injection source appears to be Neofollin Injectable, available in the Czech Republic and in Slovakia. One suggested way to obtain it is as follows: take a valid prescription for the first 3-6 months worth and travel to the Czech Republic, and purchase in a pharmacy there. Then in the future, you may be able to get refills from that pharmacy shipped elsewhere in the EU for a small charge. The EV is in ampules, so it is not in the usual packaging. Have your doctor write the prescription based on this information. Overall, there are three injectable forms of estradiol commercially available: Estradiol Valerate (EV), Estradiol Cypionate (EC) and Estradiol Benzoate (EB). These are the three primary oil-soluble esters of estradiol in production. For those in the United States who have been using EV, try the OTHER easy-to-get injectable estradiol: Estradiol Cypionate (Depo-Estradiol, “EC”). EC has a number of differences from Estradiol Valerate: (1) Its “half life” is about 9 days compared with 6.5 days for Estradiol Valerate. (When injected into the gluteus. Uptake rate is much faster in both cases when injected into the thigh.) (2) Its strength for dosage purposes appears to be approximately 2.5-3.5 times that of Estradiol Valerate, by weight in milligrams. (3) It tends to have slightly lower viscosity than most formulations of EV, so it is faster to inject through very small needles. (4) Peak levels are reached in about 4 days after the injection, compared to 2 days for EV. In general, EC seems to be a good choice for IM injection, especially for those subject to mood swings who would prefer a gentler-rising/falling E2 level for comfort. Ease of injection due to lower viscosity is another plus. Note that EC is only available in the 5mg/ml strength, which is about equivalent to EV in the 20mg/cc strength. We (moderators of the 10000-member HRT group) have observed unexpectedly low levels of estradiol in a few individuals even after injecting EC properly. We don’t have a good explanation yet, but one could theorize that there are a few bad batches of EC being sold — or that a few individuals do not get the usual high efficiency that EC is known for, and would need to increase their dosage. We are trying to find the explanation for this. 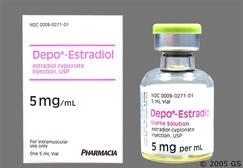 The brand name form of EC is called “Depo-Estradiol” and is made by Pfizer and can be bought (with cash discount) for about $118 per 5ml vial of the 5mg/cc. There have been generics of EC in the past, but none seem to be available at this time. There is an advantage to having it made by the “brand name” manufacturer: often generics are weaker, or more variable in quality compared to brand name drugs. Let me give an example of dosing. Suppose you take 10mg of EV per week. (That’s 0.5ml of the 20mg/cc EV, or 1.0ml of the 10mg/cc EV, or 0.25ml of the 40mg/cc EV.) To calculate, take the number of mg of EV (NOT the ml) and divide it by 3 and you get the mg of EC to take. EC is always at the 5mg/cc strength, divide 5 into the result and you get the number of ml of EC to inject. In the above case, 10mg EV divided by 3 gives you 3.3 mg; divide that by 5 and you get .66cc of EC to take. What about dosing EC with Progesterone injectable? If your progesterone is 50mg/cc strength, it combines with EC in approximately EQUAL VOLUME to give a good starting point for determining your own individual best ratio. That is, in the above example, you could round your 0.66cc up to 0.7cc, and add an equal amount of progesterone, also 0.7cc, so you get the magic number of 1.4cc total, weekly, of the mixture. This ratio can be adjusted up or down according to your needs. Even though you can mix your Progesterone and EC in the same syringe, a weekly injection of Progesterone is not useful because of its fast decay time, so a regimen consisting of twice a week Progesterone plus once a week EC would be more suitable one. Keep in mind that deep muscle injection of Progesterone is required — into the gluteus — not into the thigh, or arm. Tests show that subcutaneous injection of Progesterone is much less efficient than gluteal. The third form of estradiol injectable is Estradiol Benzoate (EB). This form is very short acting, and is in and out of the bloodstream in a matter of about 3-4 days, which requires a twice a week injection schedule at the very least. EB is more commonly used for veterinary purposes, but it is often used by trans women in Southeast Asia. See the Estradiol source table for details. Also, the practical estradiol treatment comparisons in this article may be useful. Progesterone injectable at present is also in short supply. Unlike the estradiol valerate sources, which have not notified the FDA of an official shortage or discontinuation, the Progesterone manufacturers have indeed reported an official shortage in online FDA documents. However, in the case of Progesterone there are foreign sources online that are readily available. In particular, these sources of Progesterone, AllDayChemist and InHousePharmacy are still widely used, so the trans community has not expressed such alarm as in the case of the estradiol shortage. This chart was made by a member of the HRT Forum and offers some additional information. So, don’t despair! There are many options for estradiol injection still. As I said at the top of the article, these are only your retail options. You still may have a compounding pharmacy near you which will custom make your EV injectable mixture for you, and I will try to add more information about that option later. And of course, I will attempt to update this article from time to time to reflect the current retail supply conditions. I am currently getting both estradiol and progesterone in pill form.Is there any reason for me to be concerned? An still no word from Perrigo? This is so disheartening. It’s beginning to look as though it will remain the expensive Cypionate cousin or no injectable solution without self compounding. Based on my present dosages, my Estradiol habit is a 200 dollar per month drain on my finances. ) : Soooo ridiculously expensive! Now I can send already compounded vials. 40 mg/ml, 10 ml/vial, $60/vial. Lena, I am interested. I have emailed you. Please let me know payment and shipping details via email. Thanks! Hi! Just wanted to let you know that Estradurin is currently all gone (the only form of injectable estrogen prescribed in Sweden) and is anticipated to be back in stock sometime next year. That’s around a whole year without any injectable estrogen available whatsoever. I’m going to ask my doctor if there are any worthwhile alternatives. Unfortunately, I had an allergic reaction to patches, so the only thing left is pills, but I don’t get much effect from those at all, even at high doses. If anyone knows of the situation in Denmark, maybe some could be found there? Perrigo seems to not have a clue about their own supply chain. It’s presently 10/13/2018 and still nothing but vagueries and false promises. I would think there’s something more going on behind this “shortage” and I’m concerned it’s more nefarious than I want to think about. FWIW, I finally got a IM EV 40 mg./ 5 ml. script filled and the bottle is labeled Perrigo. I’m in Missouri. Maybe they’re producing Nation wide again? Who knows as one fill is no long term guarantee, but it leaves me hopeful as the stock was clearly new. Any other women out there getting their scripts finally filled? If you’ve given up, resubmit to your pharma and if you’re filled, post up here. We live in hope! Reblogged this on The travails, history, and future experiences of a Transgender woman..
About Estraval. I too noticed that it seem to have 0 effect of Estradiol levels, but I just wanted to mention that is not manufactured by Actiza, it says it’s manufactured by Montage Laboratories (another Indian company) for Actiza and that’s why they might not have it on their site.